Schedule a Complimentary Laser Tattoo Removal Consultation. Before your first session, we will complete a consultation to determine your treatment plan. During this appointment, we will examine your tattoo and consider certain factors that dictate treatment (like size, ink type, ink depth, ink colors). We will also evaluate the size (width and height of your tattoo in square inches) to determine how many laser sessions the entire treatment will likely take, as well as the length of each session. This will also help determine your overall cost of laser tattoo removal. During sessions, the sensation of the laser is similar to that of receiving a tattoo (although the process is faster). We will work with you to ensure that you are comfortable with the process,* taking breaks during treatment if need be. Your tattoo removal sessions will be spaced several weeks apart, to allow healing to take place between treatments. * You will be provided with care instructions for your skin. There will be some swelling and redness between treatments,* alleviated by moisturizing. If you ever have questions about the healing process, contact us for assistance. Once your treatment sessions are complete, your tattoo will continue to fade. * We will evaluate the treatment site after healing is complete and determine whether you might benefit from additional sessions. This type of tattoo removal requires the highest number of treatment sessions, due to the depth of the ink. But this doesn't mean that it can't be improved with PicoSure laser treatment - schedule a complimentary consultation to learn more about how many sessions may be necessary. These types of tattoos may require fewer sessions due to the ink depth. But at the same time, there is less information known about the type of ink used, so there may be additional considerations prior to treatment. The most common types of cosmetic tattoos are eyeliner, eyebrows and lips. While permanent makeup can look great to start, the pigment may drift or change hue, leading to interest in tattoo removal. 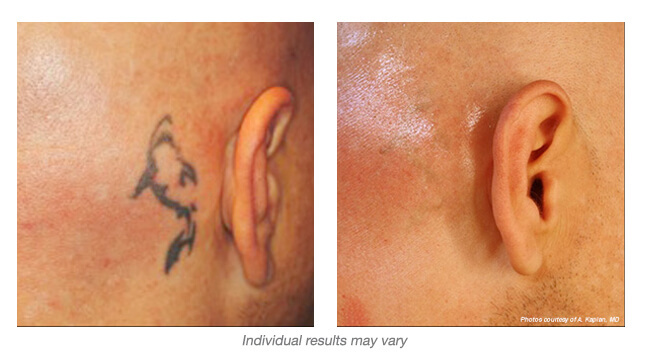 Medical tattoos and scar camouflage can be instrumental in covering scar tissue, but they may change in appearance over time. Laser tattoo removal helps patients to reset.